This article is a review of LONE SURVIVOR. Director-actor Peter Berg is coming off a stinker. One of the worst of 2012. You may have caught it. That’s right, BATTLESHIP. But it is a testament to his character that he dusted himself down and has now delivered a cut above war film. LONE SURVIVOR grows in esteem the more one chews over the presentation. It is that rare beast, a combat flick that might satisfy liberals and conservatives alike. Based on a true story, Berg helms and writes on the disastrous Operation Red Wings mission to capture/kill Taliban commander Ahmad Shahd (Yousuf Azami) in Afghanistan in 2005. Eschewing the rush to carnage, time is taken to establish the four Navy SEALs tasked to deploy. Yes, the stakes are clunkily set up, plenty of talk of their women back home, imminent marriage, etc. 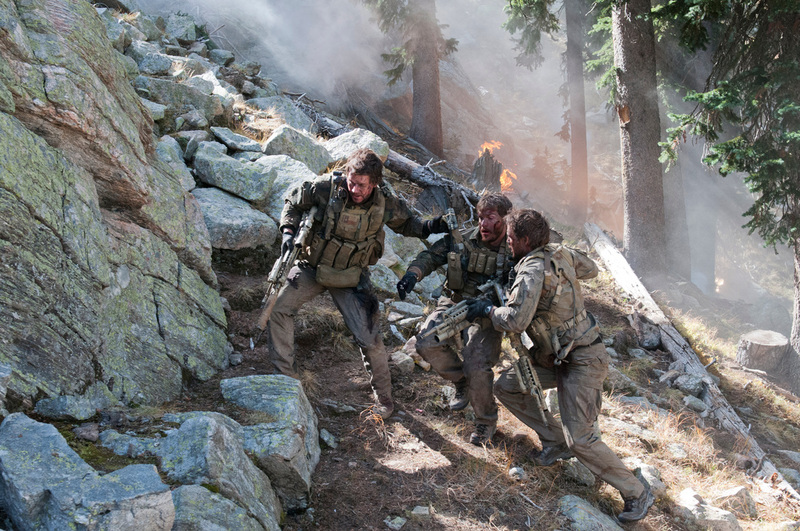 Unnecessary, as the gung-ho cast are charismatic: Mark Wahlberg, Emile Hirsch and Ben Foster. Kitsch had a rough 2012 – JOHN CARTER, BATTLESHIP, SAVAGES – and fortunately for him the movie only asks him to play to his one-note pensive mode. There are actually no speaking parts for women. This is not sexism here. The men-on-a-mission flick has been distilled right down to essentials. Once the foursome have been dropped behind enemy lines in mountainous terrain, the target is quickly acquired, but his armed entourage have been considerably underestimated. The initial credits sequence is a montage using what looks like real home movie-esque footage of Navy SEALs training. We are thus aware of how tough these hombres are. Even still, unless LONE SURVIVOR is going to play out like Arnold Schwarzenegger’s COMMANDO, the numbers are overwhelming. Fifty to one. 1. Kill their captives and continue with the operation. Wahlberg’s Marcus Luttrell reminds the gang that a life sentence in prison awaits them if it comes to light, “Rules of engagement say we can’t touch them”. 2. Tie them up and continue with the operation. It still means the prisoners are likely to die due to exposure and/or wolves. 3. Release them, hope for non-reporting to the mini-army waiting below them, and abandoning of the objective. Kitsch’s leader orders number three. The morality of one’s own survival is rarely deliberated upon in a combat movie. After clemency is granted, it is at the 55-minute mark before the carnage unfolds and is sustained for the remaining runtime. And boy does it. Berg has upped his game as a filmmaker. Gone is the jittery sub-Paul Greengrass camerawork of FRIDAY NIGHT LIGHTS and THE KINGDOM, and in its place is a muscular energy. The action sequences are bone crunching. The four take an absolute beating; from being riddled with bullets in Sam Peckinpah/John Woo-style slow-mo blood spurts, to being blown off precipices to land against jagged rock faces. For half of the exhilarating set-pieces the enjoyment is curtailed by the nagging sense of jingoism. The faceless enemy smacks of BLACK HAWK DOWN, not helped by Foster’s Matt Axelson declaring “I am the reaper”. However, the film shifts gear and presents the citizens of Afghanistan as equally antagonistic towards the Taliban. 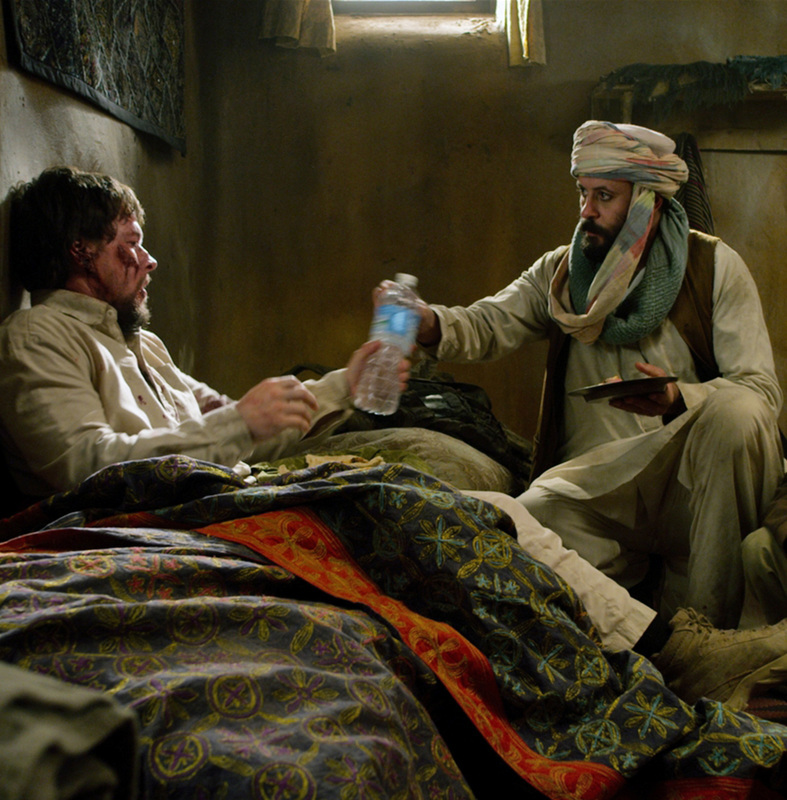 LONE SURVIVOR’s stance of avoiding ‘us and them’ propaganda, even among military hardware fetishism, allows the thriller element to be savoured. Of course this is tempered by the tragedy of the casualties. Brutal and unflinching, the melee representation doesn’t hold back. At one point Ben Foster looks as if a car has hit him. The title, and the opening sequence showing just Wahlberg returning, means we know what happens. The fact that proceedings are still gripping are a signal of skill, and more importantly that the film is not about killing and dying in a moral vacuum.